The much loved couple, Anushka Sharma and Virat Kohli returned to Mumbai returned from a trip to New Zealand. The two spent quality time together between the Indian team’s Test match and ODI series in Australia. We also snapped Arjun Kapoor at the airport. Katrina Kaif was spotted as she headed to a popular club in Mumbai. 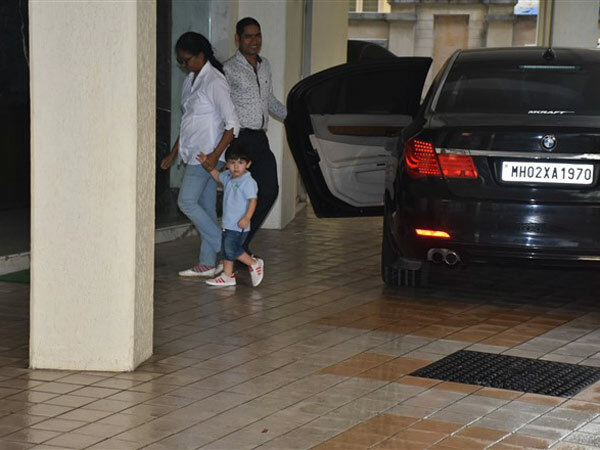 Little Nawab, Taimur Ali Khan was also spotted by our paparazzi today. Kriti Sanon posed for the shutterbugs in a cute dress. Check out all their pictures! Anushka Sharma and Virat Kohli were snapped at the airport on Monday morning as they returned to Mumbai. The couple had been spending quality time with each other in Australia and New Zealand between the Indian team’s Test and ODI series in Australia, the past one month. Anushka looked classy in a long baby pink tunic paired with ripped white jeans and white sneakers. Hubby Virat sported a casual look in dark grey tee, black denims, and an acid wash denim jacket. He too twinned with Anushka and sported white sneakers. Don’t they look lovely? Katrina Kaif was snapped at a popular restaurant in Mumbai as she headed in for lunch. Katrina looked totally chic in a lacy white top, beige pants and a crop light colored jacket. She raised the glam quotient of her outfit with beautiful studded golden pumps. On the work front, Katrina will next be seen in the Salman Khan starrer, Bharat, directed by Ali Abbas Zafar. The movie’s cast also includes Tabu, Varun Dhawan, Disha Patani making cameo appearances. Bharat is scheduled for release on June 5th, 2019. Arjun Kapoor was spotted at the airport on Monday afternoon. Arjun sported a casual look in a graphic white hoodie, black sweatpants, white sneakers, a hat and a snazzy pair of sunglasses. He has three movies up for release this year; Sandeep Aur Pinky Faraar, and India’s Most Wanted have finished filming and are in post-production while Panipat is still being filmed. Baby Nawab, Taimur was spotted by the paps today. He looked adorable in a light blue t-shirt, denim shorts and white sneakers as he looked straight into the cameras while being snapped. Kriti Sanon was also papped today looking lovely in a blue dress and white kolhapuris. Kriti has been gearing up for the release of her movie Luka Chuppi, which is set to hit the theatres on March 1st, 2019. She will be starring opposite Kartik Aaryan in the movie.